Canker sores, also known as aphthous ulcers, appear as small, painful sores in your mouth. These lesions usually go away without treatment within two weeks, according to McKinley Health Center, but certain foods can make them worse. Their location makes them susceptible to what you eat, such as foods and beverages containing citrus acid, which aggravates the sores. Canker sores develop at the base of your gums and other areas inside of your mouth, according to McKinley Health Center. These shallow ulcers differ from cold sores because you cannot pass them from person to person, they do not develop outside the mouth and often impair eating and talking because of their location. Canker sores usually heal on their own within seven to 14 days, although you may need to seek medical attention for very large lesions or sores that do not disappear within two weeks. Citric acid worsens existing canker sores and may cause you to develop more of them. 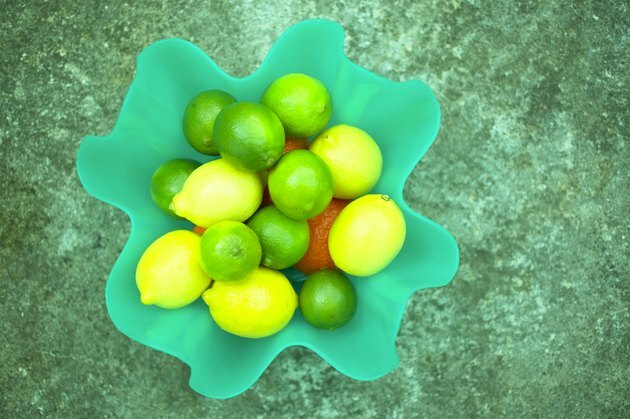 Citrus fruits such as oranges, lemons, limes and grapefruit contain citric acid. Avoid eating these items while suffering from canker sores, and do not drink juices made from citrus fruits, or you may delay the healing process and trigger a worse outbreak of sores. In addition to foods containing citric acid, other problematic items exist for canker sore sufferers. Sensitivity to certain food items, such as milk, hot coffee, chocolate, cheese, vinegar, whole wheat and nuts can initiate the lesions according to the University of Notre Dame University Health Center. Many people can eat foods containing citric acid and other common triggers without getting canker sores. This medical problem appears to have a genetic component, according to the University of Notre Dame, so some people have a natural tendency to develop these mouth ulcers. Canker sores also come from injuries like accidentally biting the inside of your mouth, getting hit in the mouth or getting cut or scraped during dental work. Stop eating and drinking citrus fruits and juices if you develop canker sores, and avoid crunchy, sharp or spicy foods. Use a soft-bristle toothbrush and brush carefully to avoid touching the ulcers. The University of Notre Dame Health Center advises rinsing with peroxide and water to soothe the lesions or rinsing with Benadryl allergy liquid and milk of magnesia. Purchase an over-the-counter numbing gel, ibuprofen or acetaminophen for particularly bad pain.